We received a good amount of submissions to our Year End Poll this year. Thanks to everyone who helped spread the word and give bands a chance to have their music heard by critics all over the country. After tallying the votes for the Open Submissions stage of our Chicago Year End Poll, it's time to release the results. Please note that no editor was allowed to vote for bands in their own scene. 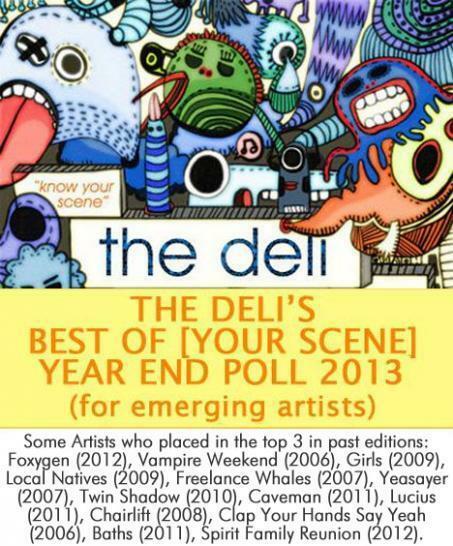 The editors that voted on the Chicago scene were: Jake Reed (Deli New England), Dawn (Deli DC Area), and Paolo De Gregorio (Deli NYC, Editor-In-Chief). In the coming weeks we will release the list of nominees chosen by our local "scene expert" jurors and our readers will get a chance to vote for their favorite Emerging Chicago Artist of 2013. WHAT'S NEXT: These results end the first phase of the poll. In the next few days we'll unveil the artists nominated by our local jurors (mostly venue promoters and other industry people who know the Chicago scene insode out), and we'll let our readers and writers influence the poll with their vote. Thanks to all the acts who submitted to us. Our open submissions pool was truly a celebration of the diversity and richness of Chicago's talent. Keep creating, keep supporting and stay tuned for your chance to vote!